Put God first, family next, then whatever you want to do. When you're needed be there. You can do anything with God's help. Marion Stegeman Hodgson, 94, of Wichita Falls, author and former Woman Airforce Service Pilot (WASP), left the "surly bonds of earth" permanently and soared heavenward on Thursday, March 24, 2016. Born in Athens, Georgia, on December 16, 1921, Marion graduated with a Bachelor of Arts in journalism from the University of Georgia in May of l941, the year of Pearl Harbor. While at Georgia, she earned her private pilot's license under the prewar Civilian Pilot Training Program. This qualified her to apply for Army Air Forces flight training — the first time in history that American women would be trained to fly military aircraft. 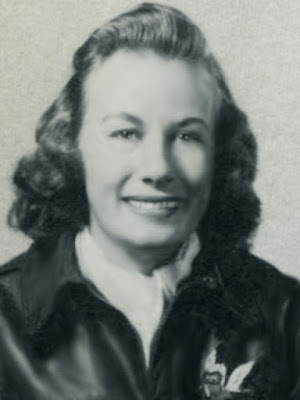 Marion won her silver wings in 1943, in one of the first classes of women to graduate from Army Air Force flight training. After graduation from flight school at Avenger Field, Sweetwater, Texas, she was stationed at Love Field in Dallas and served in the ferry command. She picked up new planes at factories and delivered them to air bases around the country as well as to points of embarkation, for overseas shipment. In 1944, Marion married a Marine pilot from her hometown, Lt. Col. Edward "Ned" Hodgson. They lived in Fort Worth for more than 50 years, rearing their family there. Marion delighted in being a stay-at-home mother while writing from her home. She produced and sold short stories and articles to national magazines, published four cookbooks and a novel, and wrote special features for the Fort Worth Star-Telegram, mostly about women pilots. Her book, Winning My Wings, recounting her WASP experiences, is now in its third printing. While living in Fort Worth, Marion was active in the Junior League and St. Andrew's Episcopal Church. Widowed in 1997, she moved two years later to Wichita Falls to be near family. She continued her membership in the 99s, an international organization of women pilots, and was sworn in at Sheppard Air Force Base as the first WASP member of the Order of Daedalions, an organization of military pilots. Always full of fun, Marion also took delight in being asked to join the International Order of Characters. Marion's primary interest and focus after the war years was faith and family. Her greatest satisfaction came through being a wife, mother, grandmother and great-grandmother. She won many honors (Texas Aviation Hall of Fame; Georgia Aviation Hall of Fame, Congressional Gold Medal), but she never felt she deserved them. "It's like God's grace," she often said, "Totally undeserved and free." A high point in her life was her baptism in the River Jordan, after becoming a late-in-life Christian. Marion is survived by son, Edward Sheldon Hodgson and his wife, Marlene (Skaggs) of Willis, TX, son, John Foster Hodgson of Louisville, KY, and wife, Robin (Blackerby); daughter, Marjorie Hodgson Parker and husband, Joe of Byers, TX; six grandchildren; and seven great-grandchildren. In lieu of flowers, donations to favorite charities or the WASP Museum, 2010 Avenger Field Rd, Sweetwater, TX 79556, are suggested. Condolences may be sent to the family at www.lunnscolonial.com. A memorial service was held at 11 a.m. on Friday, April 1, 2016, at Lunn's Colonial Funeral Home with Dr. David B. Hartman officiating. Interment will be in the Hodgson family plot, Oconee Cemetery, Athens, Georgia. Personal note: My heavy heart at the loss of Marion Hodgson is just a bit selfish and completely temporary I know. Marion was a friend and a world-class prayer partner and supporter. Every WASP loss is felt as a thundering echo that somehow shakes the heavens, but the loss of Marion is more like the sound of a beautiful symphony. This loss is heaven's gain, and my heart is overjoyed at the thought of this gentle giant of faith, finally free of earth bound challenges...finally free indeed. Throughout the years I've been privileged to know her, I have been touched by her strength through every health challenge. She met each one with grace, courage, and determination. And, as always, her endearing Southern charm, and a gentle sense of humor. With love and respect to her family and all the many, many lives she touched, loved, inspired and prayed for around the world. God bless you all.